Britain has some of the best stone circles and Neolithic sites in the UK. They’ve inspired the imagination of historians, archaeologists and even poets. These prehistoric sites represent the very first civilisations in the UK and Europe and are still the subject of debate and mystery. Archaeologists tend to agree that they were used for religious rituals and even burials but … they aren’t certain that this was there main purpose. They’ve been linked to ancient druids, ghosts, crop circles and even alien visitations. Examples such as Stonehenge would have required the efforts of hundreds if not thousands of people so there is no doubt they were of extraordinary importance. This is our list of the top ten stone circles in the UK. Arbor Low is a recumbent Neolithic stone circle located in the Peak District of the UK. The site is privately owned but managed by English Heritage and dates back to circa 2500BC. It’s comprised of around 50 limestone megaliths which were excavated from a nearby Stone Age quarry. In the centre are seven smaller megaliths which create a rough horseshoe shape or cove. Around 1902 human skeleton was unearthed near to this spot. It is one of the best preserved prehistoric monuments in Britain and was one of the first to be awarded statutory protection. The site was used as recently as the Bronze Age during which time the outer bank was rebuilt. Unlike other stone circles in the UK, it seems as if the megaliths were positioned horizontally in a radiating pattern resembling a clock face. No ‘post-holes’ have been discovered and the purpose of this layout remains a mystery. It has recently been the focus of pagan ceremonies and is said to be the axis of many ley-lines. The Rollright Stones are on the border between the counties of Warwickshire and Oxfordshire. The main stone circle is made up of 77 megaliths which are known as the King’s Men. Roughly 350 metres to the east is a Neolithic dolmen which is all that remains of an ancient burial chamber. These standing stones are known as the Whispering Knights. 80 metres to the north east of the main circle is a solitary megalith called The King. Made of sedimentary rocks, the megaliths have undergone extensive weathering and have been described as ‘lumps of leprous limestone’. The Rollright Stones are associated with many myths and legends. The stones are said to have once been a king and his soldiers who were turned to stone by a witch called mother Shipton. The Whispering Knights are said to occasionally disappear and strange lights, a sometimes frightening atmosphere and ongoing stories of witchcraft are all still associated with the stone circle. Maughanby Stone Circle – nicknamed as ‘Long Meg and Her Daughters’ – dates back to the early Bronze Age around 1500BC and is located in the English county of Cumbria. It’s one of the largest in north-western Europe and consists of 51 stones although there may once have been as many as 70. Long Meg is a single sandstone monolith located outside of the circle which may have acted as a prehistoric sundial casting a shadow onto the circle of stones to the North East. Long Meg has been engraved with petroglyphs such as a ‘cup and ring’ mark, a spiral and varying concentric circles. The origin of the name is uncertain. Some sources claim Long Meg was a ‘bad’ witch who was turned stone, along with her coven, by a ‘good’ wizard – Michael of Scotland. Other sources suggest it was named after the giantess ‘Meg of Westminster’ who was buried in the North. Both legends tell of a mysterious treasure of gold buried nearby. The site is believed to be protected by supernatural storms. Castlerigg is located at the summit of a low hill and surrounded by a natural amphitheatre of larger peaks including Blencathra, Skiddaw, and Lonscale Fell. This makes it one of the most picturesque stone circles in Britain with striking views of the surrounding landscape. The circle is 30 metres wide and is officially made up of 40 megaliths. However, the exact number is uncertain as erosion has revealed some four additional stones that may have once been upright or were perhaps only ever used for packing the larger megaliths. Dating back to around 3000BC it is one of the oldest stone circles in the UK. Archeo-astronomers have studied the site and believe that they have discovered a number of significant alignments. 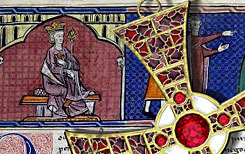 In particular, they believe that certain of the stones are specifically associated with the position of the midwinter sunrise and the orbit of the Moon. As with all other stone circles the exact reason for Castlerigg’s construction remains a mystery. Stanton Drew is the 3rd largest collection of prehistoric megaliths in England and is made up of three interrelated stone circles. The Great Circle has a circumference of 355 metres and has 26 upright stones. Archaeological surveys conducted in 1997 show that the remaining circles were once part of a much larger site which may have extended from the Cove as far as the Neolithic burial site known as Hautville Quoit – a distance of 825 metres. The research also revealed numerous pits that may have been used for megaliths or other ritual purposes. Legend has it that a wedding party was held on a Sunday but the only musician who would play was the Devil in disguise. At the end of the dance the partygoers were turned to stone for their wickedness. It’s an important site for pagan weddings and ceremonies. it is quite common to find small offerings hidden in the holes of the stones. It is considered to be very unlucky to remove them. The Ring of Brodgar is a Neolithic stone circle and henge on the largest island in Orkney, Scotland. It is situated on a small strip of land between the Lochs of Harray and Stenness and dates back to around 3,300BC. The stone circle is 104 metres (341 ft) in diameter and the outer henge has a circumference of 418 metres. It’s believed that the Ring of Brodgar initially had 60 megaliths but only 27 currently remain upright. The first official survey of the complex was carried out in 1849 Captain F.W.L. Thomas of HM cutter Woodlark. There are many mysteries associated with the site but perhaps the most interesting is why the nearby Ness of Brodgar was suddenly abandoned some 4,300 years ago. It appears as if a vast feast was held at which up to 600 cattle were slaughtered after which the historical and archaeological record fades away. Theories ranging from climate change to a sudden shift in religious beliefs have been put forward but the real reason for the exodus remains elusive. The Callanish Stones (Tursachan Chalanais) are located on the west coast of the Isle of Lewis in the Outer Hebrides and date back to around 2900BC – although there is some evidence to suggest that Neolithic development of the site dates back even earlier. Thirteen central stones form a circle roughly 13 metres in diameter at the axis of two stone-demarcated avenues which form the shape of a cross. A single monolith is positioned at the very centre. Folklore tales explain that the stones were created when a group giants rejected Christianity and were turned to rocks by Saint Kieran as a punishment. Another legend refers to the site being associated with the arrival of the “shining One” every Midsummer’s solstice. The stones have been depicted on an album cover for the band Ultravox and were featured in the 2012 animated film ‘Brave’ which tells the story of a young Scottish Girl and her quest for personal independence. The site is now in the care of Historic Scotland. The Beaghmore stone circles and cairns date back to the late Neolithic and Early Bronze Age periods around 2,000-1,200 BC. They were discovered quite recently in or around 1942 and their magnitude went largely unnoticed due to the disruption caused by WWII. What makes these prehistoric monuments so important is the sheer scale of the complex. It features seven low stone circles of varying sizes, six of which are paired. There are also twelve cairns and ten megalithic rows integrated into the overall layout. One of the circles is highly unusual as it has 800 smaller stones erected inside its perimeter. These have come to be known as the Dragon’s Teeth. More than 1,250 specific stones have been identified making it one of the largest formations of its kind. The largest cairn was found to contain the branch from an oak tree. Archaeologists believe that only a portion of the total site has been revealed. It is in the care of the Northern Ireland Environment and Heritage Service. The Avebury Neolithic stone circles are actually larger than Stonehenge and just as mysterious. Dating back to 2600 BC, the complex comprises the main circles, cove, two ceremonial avenues and numerous barrows, tumuli’s and other earthworks. It’s important to modern pagans as a religious site, and is also infamous for strange lights, demon myths, visitations and the barber skeleton mystery. Visitors to Avebury quickly notice that many of the stones have unusual holes that seem to disappear deep into the interior of the megaliths. A question that is often asked is, ‘was this a temple dedicated to a sun god snake cult?’ Many people point out that the arrangement of the avenues and the stone circles creates a distinctive serpentine shape. The megaliths at Avebury are well known for their complex patterns made from generations of rare lichens. A recent survey noted 32 species on a single Sarsen stone. Read more about Avebury Stone Circle. 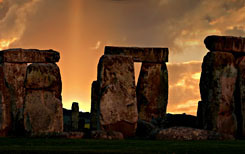 tonehenge is Britain’s most important ancient monument and has been recognised as such throughout history. It’s certainly one of the UK’s most important tourist destinations and attracts about 900,000 visitors every year generating about 6.3 million Pounds in direct tourism revenue and as much as 22 million Pounds in direct economic impact. Stonehenge is a Neolithic monument located in Wiltshire, UK and is the most famous Neolithic site in the World. Archaeologists and historians believe it was constructed between 3000 BC and 2000 BC. There have been many theories as to why the site was abandoned from around 1800BC. They range from tribal conflicts to sickness and mass depopulation. It does seem that the site diminished in importance at the same time as the arrival of the Beaker People. As those ‘beakers’ were probably used for alcohol it’s ironic to think that Stonehenge may have been superseded by the World’s first pubs.